The sky was totally overcast as we left Jerusalem on Road 443. There was no traffic on this busy commuter route to the Tel Aviv area. but there was kilometer after kilometer of newly-strung barbed wire. The skies began to clear as we neared the new checkpoint. Not many people or cars were near the checkpoint area. but at least day one was quiet. and vast stretches of empty land. but no long lines of cars. The old checkpoint was deserted. that twists up the hills to Jerusalem. 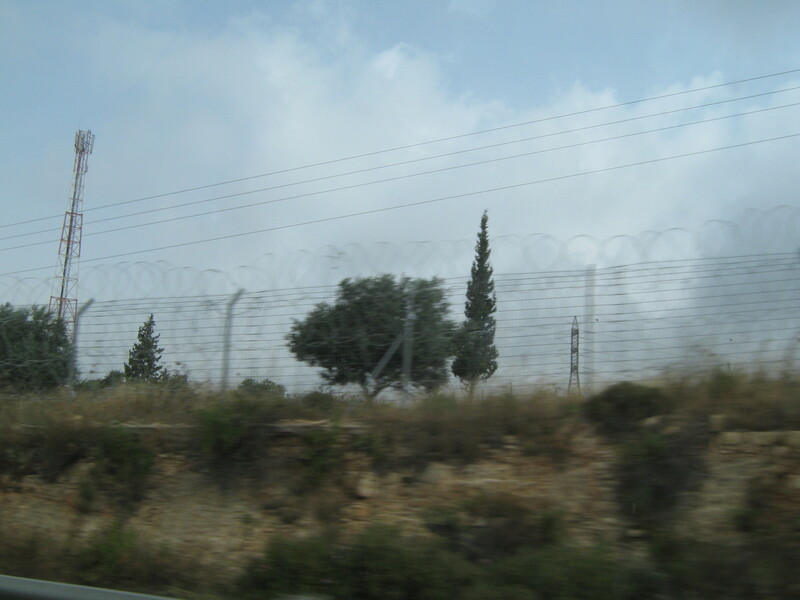 the road to Ramallah is still off limits to almost everyone. Friday’s always a quiet day – traffic wise – on 443. The rock-throwing usually takes place during the week. It is a beautiful drive, though, and the villages and hillsides and olive trees are gorgeous.